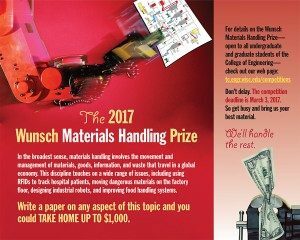 The Wunsch Materials Handling Prize rewards those who submit innovative papers on the topic of materials handling. Prizes of up to $1,000 are offered for papers on any topic that relates to materials handling, including robotic transport, micro-electronics manufacturing, automated assembly, and manipulation of materials in packaging. The competition is open to both graduate students and undergraduates who hold at least sophomore status. The deadline for the Wunsch Prize is noon on March 1, 2019. Each contestant is allowed one entry, of which he or she must be the sole author. There is no limit on length of the essay. Entries must be typed—handwritten entries are not accepted—and if outside sources are used, they must be cited using a proper style such as APA, IEEE, or MLA. To enter the contest, submit three separately stapled copies of the paper that are attached via clamp or paper clip to the contest entry form. The author’s name must appear only on the entry form, which is available for download here or from the Technical Communication Program, Room 2107 Mechanical Engineering Building. The author’s name must be left off all submitted entry copies. Submit your material to the Technical Communication Program, Room 2107 Mechanical Engineering Building.